The 'Sadhushongo', the congregation of the saintly practitioners of wisdom and intitiated by Fakir Lalon Shah as the "Gour Purnima" festival is an attraction for common people and for farmers. Cheuria, in the District Kushtia of Bangladesh, obtains a festive mood during the three Full-moon days with hundreds of thousands of people coming from all around the country as well as from across the border. This is also an opportunity for the Nayakrishi farmers to invite people attending the festival and demonstrate their art and wisdom of biodiversity-based ecological agriculture very much in tune with the spirituality of the occasion. This year, the festival was held from 28 February to 2nd March 2018. Nayakrishi farmers from Natore, Tangail and different upazillas of Kushtia gathered in Nobopran Akhrabari, the space established by Nobopran Andolon to network with the leading spiritual leaders of Bengal. In this event, farmers always bring seeds from their households and Seed Huts. Seed is considered the most tangible and concrete material body manifesting the totalities of the relation of life with the universe, and therefore a highly spiritual object. Seed as potential life form signifies the mystery, energy, planetary influence and all the cyclical and immanent potentialities of the universe. 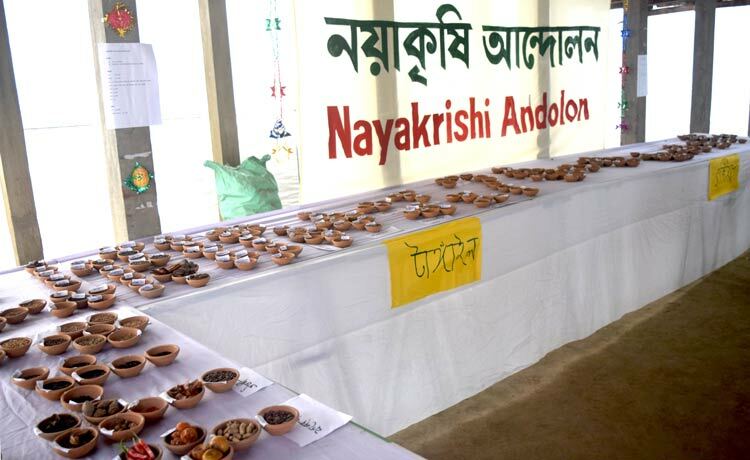 It is a regular practice of Nayakrishi farmers to exhibit their collection of diverse seeds and genetic resources and discuss with the visitors who come to pay respect to Fakir Lalon Shah. These people also visit Nobopran Akhrabari. The diversity of the local variety of seeds attracts people. Many of them have hardly seen such varieties in one place. Moreover, this is not just to show the numbers and the diversity but also to discuss and disseminate the knowledge and practice of Nayakrishi. Like seed, nature provides all inputs necessary for farming, therefore biodiversity-based farming practice does not apply chemical fertilizers and pesticides or hardly any external inputs. All farming requirement could be generated within the community of farming household. Farmers demonstrate how we, as human beings, are capable of reconfiguring our relation with and develop in harmony with nature's energy and potentialities to accomplish that task. without being dictated by agro-business companies and destructive scientific practices. Science and knowledge that nurtures nature is welcome but practices that engineer and manipulate nature to the benefit of transnational corporations are strictly avoided. The fundamental agrarian principle of anyone following Fakir Lalon Shah must be the nurturing of life and unfolding the energies of nature for the benefit of all life forms. None of the life forms turns into pest or act harmfully unless we deny its right place in the overall design of nature. Killing any life form in the name of killing pest not only denies the right to life but also kills every other life forms surrounding the crop that are essential for farming and our survival. Pesticides and chemicals are affecting the humans for whom the crop was saved for. The seed exhibition, therefore, goes beyond what is on the exhibit table, it becomes linked to the Lalon songs that are being presented by the Sadhus and other singers celebrating value and integrity of life. It becomes part of the sharing of knowledge and wisdom among people. Nayakrishi farmers become very confident in this sharing as they 'keep seeds in their hands' as the most strategic tool of farming. They have seeds preserved from crops of each season in their own house (ex situ) and they plant, conserve and regenerate seeds for regeneration (in situ). Farmers are facing intense challenges from the market aggression of company seeds. But Nayakrishi Seed Network known as “Nayakrishi Beez Shongho” is playing the role of a nucleus among the farmers to preserve, regenerate and expand the diversity of seeds that they need in their everyday life as farmers. Apart from ensuring seed and food sovereignty seeds provide cultural and social needs and above all maintains the integrity of the material basis of farming communities. Undoubtedly, seeds are key to agriculture and the most determining element in the performance of agrarian systems. Corporate agriculture is desperate to control seed market in order to control both seed and food sector. Corporations have made international legal regime to patent seeds through Intellectual Property Rights (IPR); the seeds which were preserved by the farmers for thousands of years, are now suddenly open to biopiracy. Biopiracy had always been integral to colonial extraction of wealth and resources. Colonizers not only stole our genetic resources, but the development of the so-called botanical and biological sciences are themselves colonial instrument for classification, systematization and appropriation of knowledge and resources of the colonized. In the era of globalization, farming communities are reduced into consumers and must purchase seeds from the market that have been stolen from them earlier and now being marketed as proprietary knowledge of the private companies. Nayakrishi farmers observe that seeds sold in the market are mostly hybrid or HYV. This is mainly to destroy the farmer seed system so that farmers are compelled to buy corporate seeds from the market. There are other alarming trends. The Department of Agricultural Extension (DAE) started to distribute genetically modified brinjal seeds, the Golden rice and some varieties of potatoes. It is obvious that agricultural science and institutions, technological innovation, government policy, agricultural extension activities and the ideology of the 'high yielding' seeds collectively aim to destroy the farmer's seed system in order to create the global commercial market for seed. In this context, defending farmers' seed system becomes the key activity to defend farming against corporate monopoly over seed and food. To stand against the corporate warfare against farming communities to destroy natural seed and biological resources in order to monopolise seed, genetic resources and global food system is the major challenge of our survival. 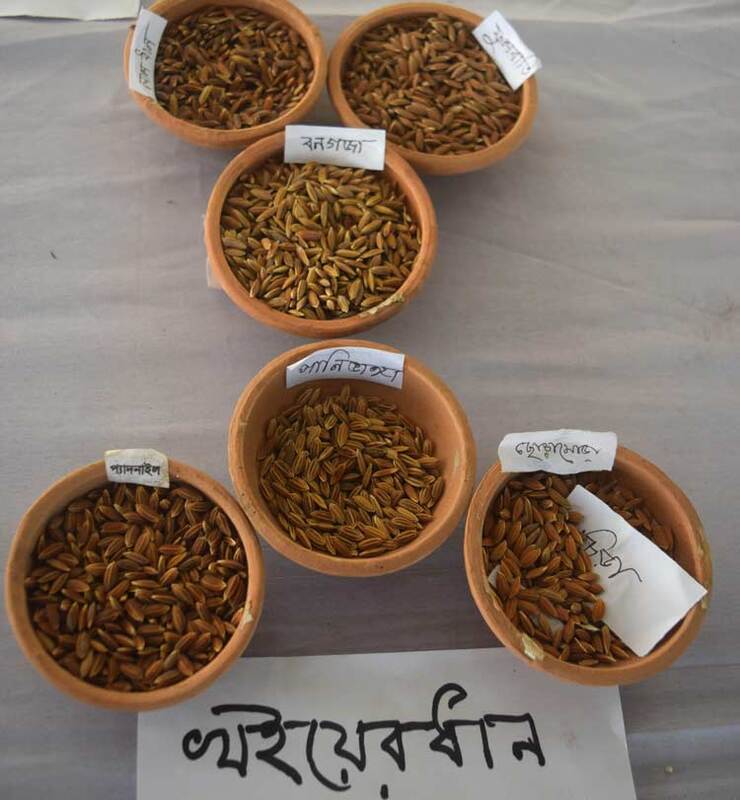 In the festival, farmers Nehar Banu, Ruposhi Begum, Osman Gani, Nazimuddin were sharing their knowledge about local variety of seeds and some visitors became nostalgic. “Oh, yes, we heard about these varieties from our grandparents. But now these are not available”. The farmers protested against this. No, that is not true. Local variety seeds are ‘endangered’ but have not disappeared. These farmers have brought these seeds from the crops of their fields. 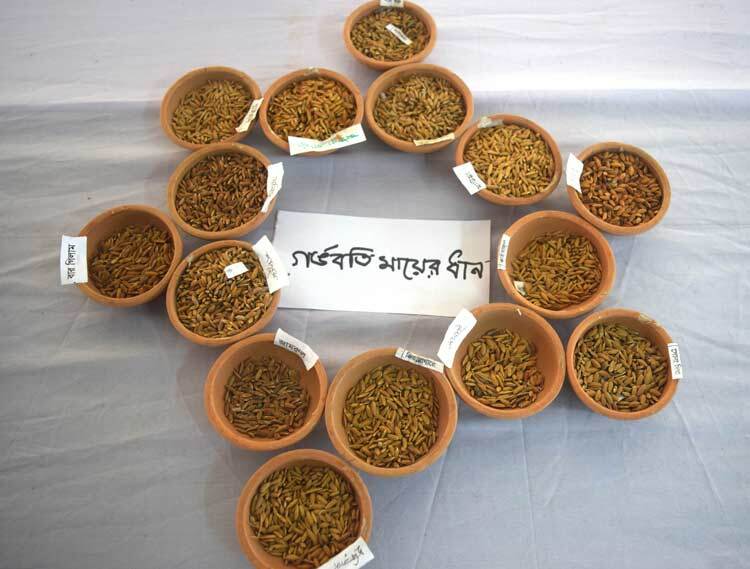 In this exhibition which is just a small sample of the collection of farmers’ seeds, there were 149 paddy varieties, 29 vegetables, 17 spices, 11 fruits and 33 different medicinal fruit and herbs. 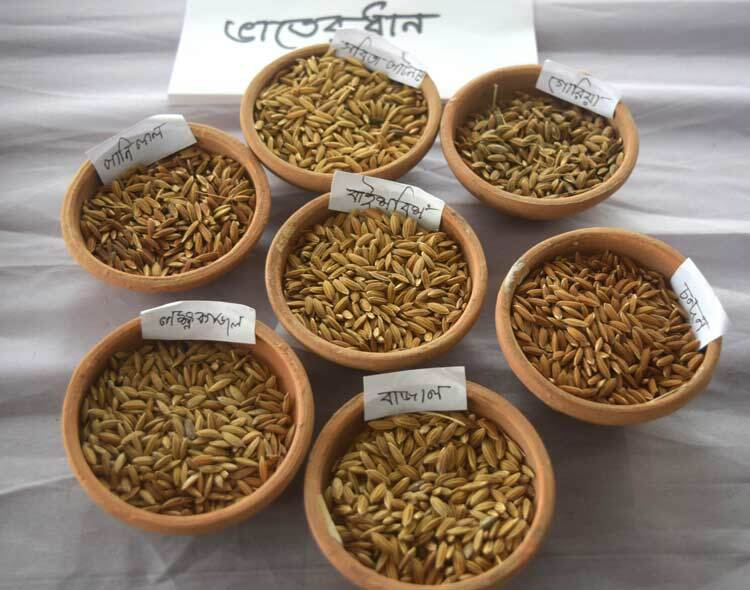 In the Nayakrishi centres of Tangail, farmers have regenerated 1741 varieties, Pabna and Natore 435 and in Kushtia 375 varieties of rice. 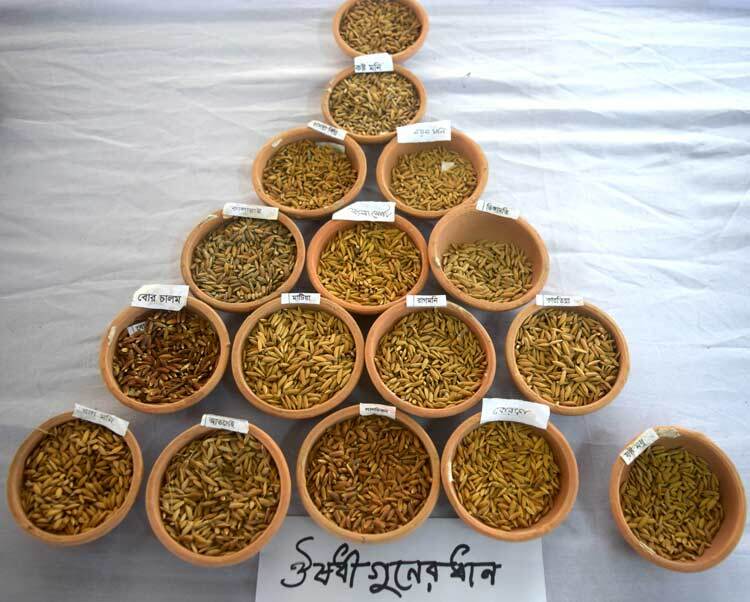 The vegetable seeds in Tangail are 240, Pabna 125 and in Kushtia 260 varieties. All these are available ex-situ and in situ, so nothing is coming from any seed museum. All these seeds have individual names and their descriptions are available in the farmers’ knowledge and also documented in the Community Seed Wealth Centre. Farmers are, of course, very concerned about many local varieties not being cultivated by all the farmers as the HYV and Hybrid seeds are being promoted by companies and the government. They apprehend of a situation when the seeds will be “lost” or “disappear” because original local seeds are being replaced. At one point they may “forget” the name of the seed. If the name and seed description is lost from the memory of the farmers then it is difficult to regain control. But companies, who have already pirated the seed will sell to us back with their patent on it. Those commercial products will no more be farmers’ seed, but corporate merchandise. Therefore, seeds must be kept in farmers hand, means they must be kept in farmer's household ex-situ and in situ as have been preserved for hundreds of years. Seeds must not be lost from the hand of farmers. 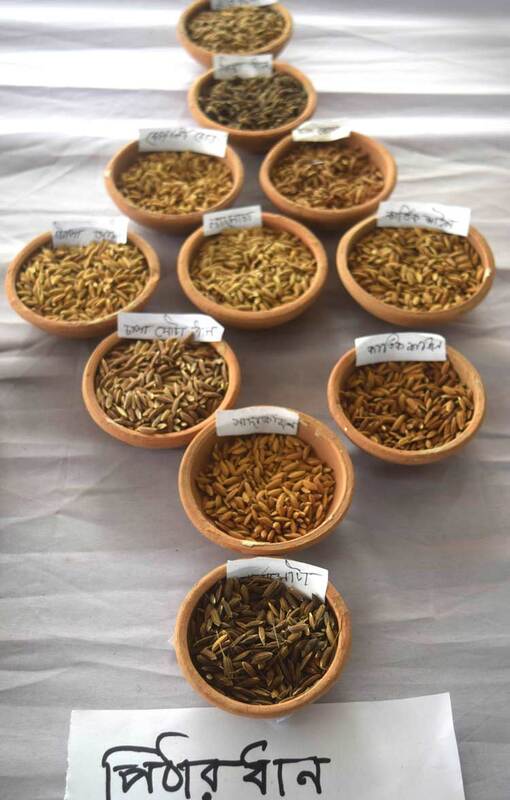 Nehar Banu of Natore lamented that they have “lost” few Aus varieties of rice such as Kala manik, Baola Aus, Morich buti and Dholai boron. But Nayakrishi has re-introduced some of these varieties such as Kala manik in Tangail. Binni rice is available in Kushtia, but not found anymore in Natore. Pokhkhi Raj rice is also “lost” in the villages. Nehar Banu remembers that the rice was golden in colour, with white on both sides. Due to frequent disasters, this rice is not cultivated by farmers. Remembering the names of rice varieties is crucial. Farmers say if you forget the name you are at risk of losing the variety. However, same rice variety may have a different name in the different area. For example, Kartik Shail was brought from Natore, but Ruposhi Begum from Tangail said we have the same variety in the name of Kartik Kaika. In corporate commercial seed system, seed is essentially a commodity and means for profit. In contrast, farmer's seed system is the foundation of agriculture. Seed by definition is the means of regeneration of life, natural foundation of farming and the means to meet the biological need of human beings and other life forms. Seeds are not abstract nameless entity, they have specific name and history and are associated with the knowledge base of the community. 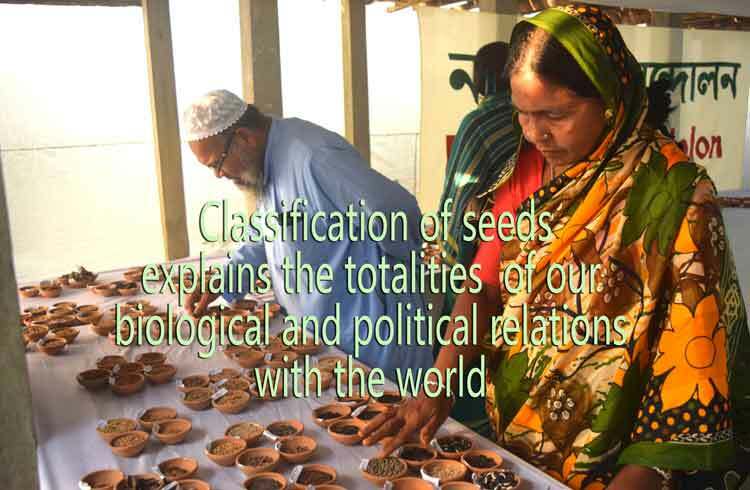 Each variety of seed also signify particular ecosystem and environment where they perform well compared to other varieties. When farmers keep seeds and preserve certain variety, they also preserve a bio-regional plan and purpose. They know exactly where they will plant particular varieties of seeds in a particular village or in a specific bio-geographical landscape. Each seed variety is like a store house of local knowledge and agrarian practices. Rice seeds are important not only because rice is a 'staple food', a term coined during the Green Revolution, but each variety is integral to ecology, culture and specific biological need of the people. It is not the same rice variety that is consumed by all the people in all the areas. The local variety of rice are grown according to geographical location and local tradition. In Bangladesh, for example, people of the south have different varieties of rice that they eat every day as “Bhat” (cooked rice), while people in the north often do not use the same varieties; different varieties appropriate to local environment, agro-ecological conditions, taste and cuisine systems are planted. 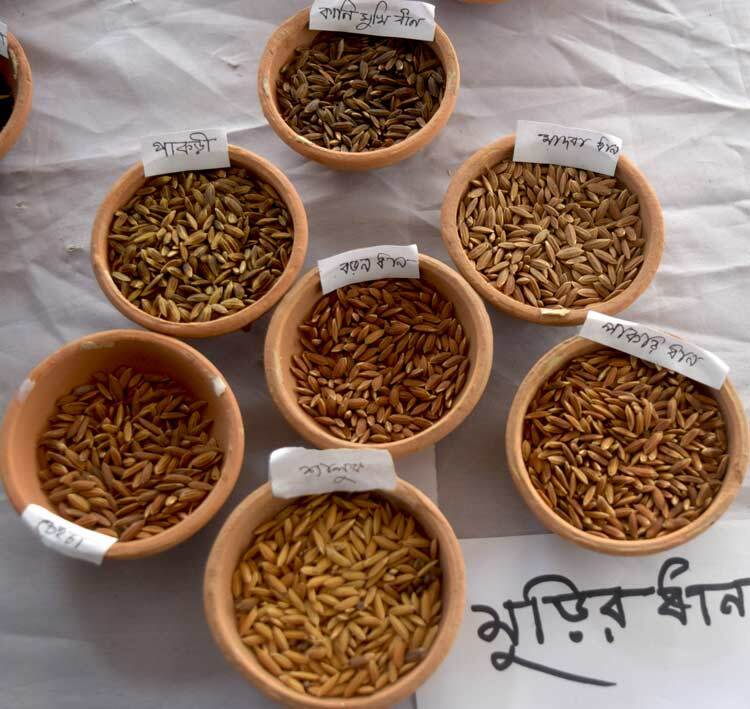 However, the introduction of modern high yielding variety and the government’s efforts to ensure food security for a non-farming and urban population, the ‘bhat’ rice has become limited to a few modern varieties, e.g., BR-28, 29, Miniket etc. Monoculture has overturned the bio-diverse farming practices. 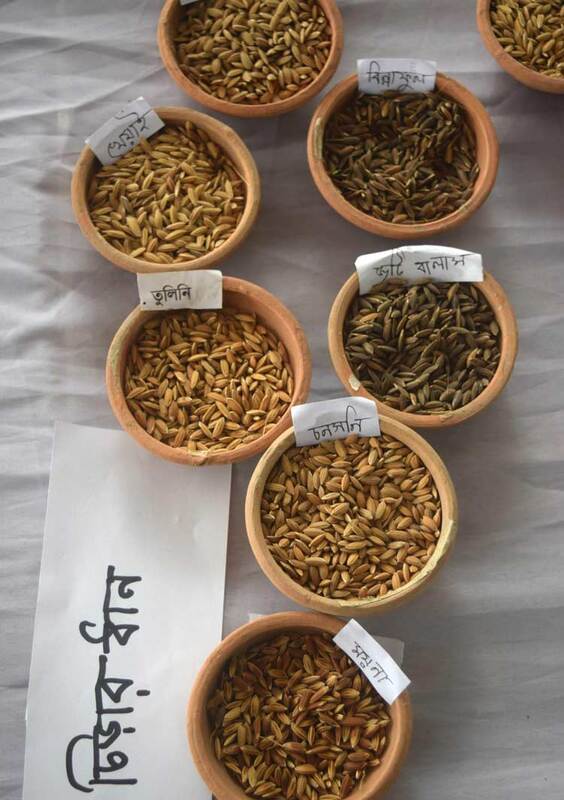 In the festival, Nayakrishi farmers presented seven specific varieties of red and white rice having the names Bajal, Lokho kajal, Pani lal, baishbish, Goria, Chandan, Sabita Patnay etc. The other varieties which are classified as drought or flood resistant are used for 'bhat' - the cooked rice. Those are available in Aus, Aman and Boro seasons. Each season produces a different variety of rice for bhat. But this is not distinguished properly in the market. The market only differentiates primarily by coarse and fine quality (meant for poor and the rich), by white or red/brown rice. The consumers have no idea about the rice where it is grown, in which season and what is the name of the variety. As consumer, one who takes rice as a staple also goes through different health conditions. The use of rice changes in those conditions. In the villages, a sick person is given a different variety of cooked rice or 'Bhat'. 'Bhat' is not a general abstract term, but relates to specific variety with different nutritional value. There are particular varieties to meet health needs, weak post-traumatic condition, digestive problems and lack of nutrition. In the exhibition, 15 varieties of rice were presented as medicinal rice used as Bhat or "Pottho" - the nutritional supplement. These are Atgei, Lal chikon, borka, kartiya, Ragmoni, Satia, Borchkolom, Kalarai, Jolamota, Dingamoti, Kaisabinni, Nayan moni, Shostimodhu, Oshtomoni and baitasona. 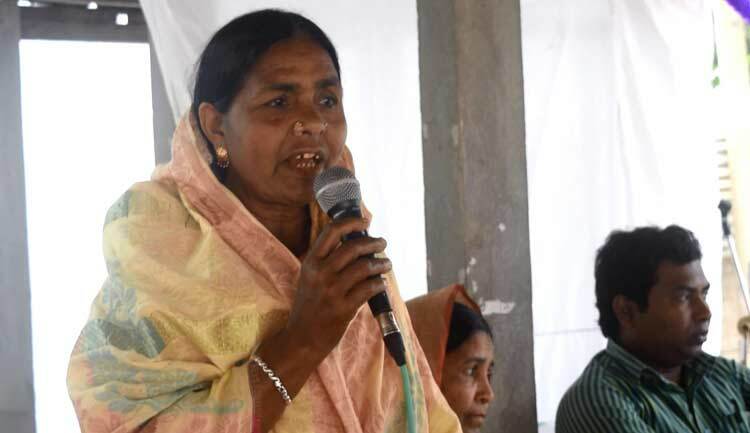 Farmer Aminul Islam Gain from Kushtia talked about an endangered variety of rice called Jobahul, which was given to patients with a stomach disease. Only a few farmers are cultivating this rice variety in his village. Pregnant and lactating mothers are given different varieties of rice as ‘Bhat’ which are needed for increased breast milk, nutrition of the baby and the mother in the post-natal stage. These are Dudhraj, Jamrul, jiagaro, Sonai, Sonaidigha, kaisaful, matia, shaluk, barkhilam, malshira, gairal, lalsoru, moinamoti and maisakhali. Special dishes are prepared for guests and for relatives when they visit. They are very important and cannot just be fed with the regular rice varieties for bhat. For them aromatic and fine quality rice is there. Polau is cooked and paish is made as desert. Farmers have to cultivate such varieties in order to have their own supply as required in the family. On rainy days, khichuri is cooked, a mix of rice with dal. Kichuri is good with aromatic fine quality rice. Having Hilsha fish or at least Begun bhaji - fried brinjal with kichuri is a special treat. The aromatic rice varieties are Kalijira, Begun bichi, Jamaichita, Sarni, surjo mukhi, Khirnali. These have lower yield but gets high price in the market. Farmers produce these in less quantity, but of course ensure enough for family need. Besides the need for Bhat and special-treat polau, kichuri, rice varieties are needed for other purposes particularly for snacks and for breakfast items. “Pitha” is a very important preparation of snacks with the rice powder. With new rice, husked in Dheki, delicious pithas are made. The winter season with the availability of date-palm molasses (Khejur gur), sugarcane molasses and with coconut, women make a wide range of variety of pithas, which they enjoy with relatives and neighbours in the villages. Songs are made on pitha. Farmers are happy with the arrival of new rice from the Aman season. But pithas cannot be made with all varieties of rice. These need Kalamota, Sada Kajol, Chapa mota, Topa Aman, Lalmocha, Kartik shail, Boali, Jiadhan, dudhkotki, talrodha, Ajoldigha, Dhol digha, kalpat, pakri, bhorilota, madhbha, kalamucha, hida, jhingamoul, sada dhepa, lalkaika, dudhraj kala bokri, roajoba, lalshona, shaluk and laldepha. Puffed rice (Muri), pressed rice (Chira) and Popped rice (Khoi ) are three most commonly used rice products. Muri is a common breakfast item and also consumed throughout the day in different forms. It is also a very common street food item called Jhal-muri - the spicy puffed rice. Chira is used as a substitute of bhat in the case of stomach troubles and also as snacks. Chira is a very important disaster relief food item as it can be consumed without cooking and taken with mollases. Khoi is a favourate snack item consumed with yoghurt. Different rice varieties are used for Muri, chira and khoi. Muri: Mukh kalani, Malshira, Barisal, taragona, shaluk, cheicha, pakrikanimukhi, boron, agunshail, kartik kaika, horingachamara, hijol digha, rajshail, shalik shail, hidi, lal dhepa, lotiraj, Dadmoni, nilroda, jhinga shail, khora jamuri and renful. Chira: Moina, Shaila, Chonshoni, Jotibalam, Tulini, kheyai, Shilkomor, binnaful, pai tonga, Natua, Baikali, paijam, shilkamor, shorno, holud jaron, bashiraj, kalobokri, jhingashail, boron and jolamota. Come to my house, friend, I will let you seat on crafted wood, treat you with chira made of best local shali rice, and khoi made of the special binni variety.